When you go to a podiatrist, you know you’ll be seen by someone who specializes in feet. When your child needs medical care, you’ll want someone who has a lot of training in pediatrics. Many doctors have a specialization, which helps patients know what they can do. But do you know what a chiropractor does? We also have a specialty, but not many people know what that focus is. Where many other medical specialties focus on a single area or function in the body, so do we — kind of. A chiropractor is someone trained in spine, joint, and nervous system health. Given that, you can see how a chiropractor’s focus is both specialized and one that can help treat ailments throughout the body. You may have guessed this one since spinal health plays a big role in pretty much all back pain. Since chiropractors focus so heavily on spinal health, our training allows us to provide back pain relief and healing without relying on invasive surgeries or prescription medications. During initial sessions, your chiropractor can offer adjustments to provide natural pain relief. Over time, chiropractic care can help joints shift back into proper alignment, reduce any muscle or ligament strain that may have affected the misalignment, and help the body heal. It’s common knowledge that there are a lot of aches and pains that occur throughout pregnancy. The body does a lot of shifting to accommodate a growing baby, which can cause alignment issues for several joints. In addition, the baby’s weight places additional strain on the low back, hips, and legs. Add to that the limitations on pain medicine, and pregnancy can get pretty uncomfortable. Fortunately, chiropractic care is a perfectly safe means of relieving pain and helping joint alignment throughout pregnancy. Some studies suggest that regular chiropractic sessions can even help ease labor pains! Given how connected your neck and shoulders are to the rest of your back, it stands to reason that a chiropractor can also help if you experience neck and back pain. Chiropractic adjustments can also help if you experience regular neck or shoulder pain associated with things like working at a computer or supporting a phone between your head and shoulder. A chiropractor can do an assessment to help find the source of the pain, then build up strength in those areas to help provide long-term pain relief. Has your doctor mentioned that many recurring headaches stem from tension in the neck and shoulders? It’s true. Tight muscles can strain supporting ligaments and tendons, which can reduce range of motion and increase tension on joints. Chiropractic manipulations can help ease that tension, thereby relieving the headache. Recurring chiropractic visits can help increase range of motion and ease tension to provide more lasting results. As we mentioned above, this is just the start of what a chiropractor can do to help. 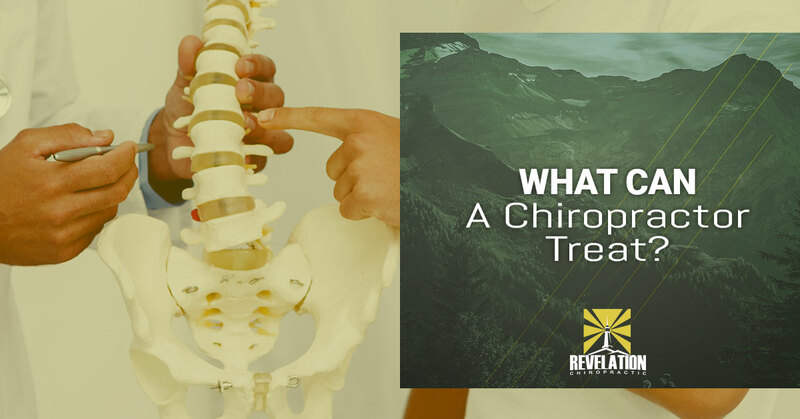 If you have questions about a specific concern, the team here at Revelation Chiropractic can help. Contact us online, give us a call, or come by our Fort Collins office to learn more.